“Baba You’re Beautiful Baba” is probably that one dialogue which everyone took an instant liking to in the first season of TVF’s Tripling starring Sumeet Vyas, Amol Parasher and Maanvi Gagroo. The concept of spinning a web series around siblings who are distanced, distinct yet always ready to take each other’s backs hit the right nerves with the audiences. Now, the trio is back for a second season which is now streaming on TVF Play and Sony LIV. Whilst retaining the original cast, the new season also offers some surprises such as Kubra Sait, Gajaraj Rao, Rajit Kapoor and Shweta Tripathi in interesting cameos. 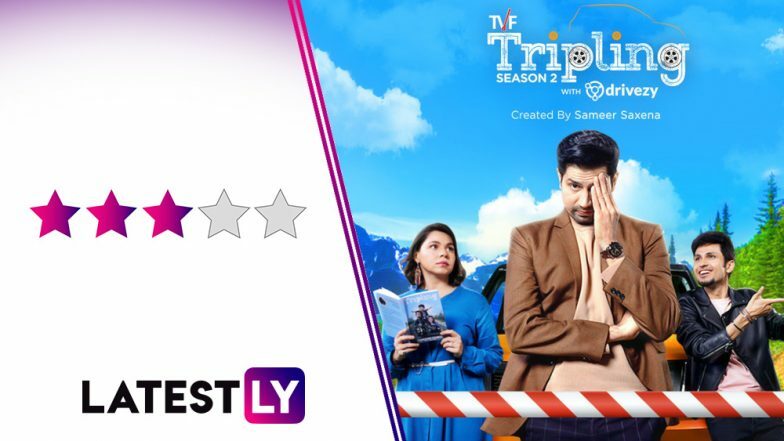 With a five episode season and every episode is approximately 30 minutes long, Tripling 2 is perfect for a quick watch, that people can indulge in during their travel. What would have worked wonders is if this quick runtime had also promised a little more quick-wittedness. The second season written by Sumeet Vyas and Akarsh Khurrana is good on the laughs but slumps on the relatability quotient that its first season so generously offered. The plot takes off from Sumeet Vyas’ Chandan Sharma having documented the siblings’ road trip stories from the first season into a book. The book’s success has resulted in it being picked up for a movie and while Chandan is enjoying the attention, the effect of his writing has been different on his sister Chanchal (Maanvi Gagroo) and brother Chitvan’s (Amol Parashar) life. A lot has changed since the first season, Chanchal has now become the MLA after her husband Pranav (Kunal Roy Kapur) goes missing owing to the humiliation caused by Chandan's book which jokes 'Jijaji Banjh Hai'. Chitvan is taking care of his girlfriend's child and wants to name him 'Cheetah' Sharma. Made in Heaven, Delhi Crime, Gandi Baat: 5 Most Talked About Web-Series of the First Quarter of 2019. Vyas and Khurrana bring a sense of familiarity with references to the previous season but add new layers to the lead trio’s characters, thus making it an interesting watch. For a character like Chitvan who comes across as the most fun-loving, carefree person, once the paternal instincts kick-in, it is nice to see a different side of him. His girlfriend, Sheetal (Kubra Sait) on the other hand is a different species altogether. Her idea of having live music at home actually involves having artists singing in the background. And yes, she is a human rights lawyer. The new characters of, Nawab Alexander (Gajaraj Rao) and Byomkesh Bakshi (Rajit Kapoor) are all sweet additions that even form as a tribute to the 90s. The whole Nawab angle does pull the pace down but it is Rao's phenomenal act that keeps us engaged. Also, Chitvan's fun antics at the Nawab's mansion keep the episode taut with humor. This time, the road trip spreads moves from Jaipur to Kolkata and the final destination is Sikkim, all in search of Pranav whose storyline seems to be the weakest. Chanchal and Pranav's relationship problems seem far bigger and they are not addressed properly in the series. Also, we truly wish the parents played by Shernaaz Patel and Kumud Mishra had gotten better screentime. They brought on the crucial emotional quotient in the first season. In other disappointments, the product placement of sponsors needed to be a little subtle and does turn out to be annoying this time. While Sumeet and Maanvi play their parts to perfection, it is clearly Amol Parashar who stands out with his amazing comic timing. This time, he doesn't need Blue hair to make the desired impact. Jennifer Winget and Karan Wahi Come Together For A Web-Series; Announce The News To Fans! Watch Video. Even though this may be a bumpy ride, it does not cease to be any less fun. Tripling 2 is just the right kind of entertainment you need in your spare time.